St. Martin's Press, 9781250006264, 264pp. When her orange tabby, Zak, disappeared, Nancy Davidson did what countless people before her had done. She made a lost cat poster. And after days of frantic searching, she found him. Nancy was ecstatic. Zak seemed happy, too although being a cat, it was hard to tell. Zak may have remained his old self, but Nancy had changed. From that moment on, she became acutely aware of lost cat posters. She studied their language, composition, and design. She was drawn to their folk art. Mostly, however, she was intrigued by the messages themselves the stories "behind "the posters. It wasn't long before Nancy reached out to other owners of lost and found cats to offer empathy and support. They told hilarious and often poignant stories. They sought advice. That's when Dr. Nancy, the cat lover and the seasoned therapist, stepped in and offered insights brought to light by her shrewd, but never self-serious analysis. What they told her and what she learns creates a captivating look into the heart of our relationships with our pets and each other. For seven years, Dr. Nancy followed the lost cat trail discovering answers to a question that eventually touches all of us: What will you do for love? "The Secrets of Lost Cats "traces the evolution of Nancy Davidson's seven-year passion for lost cat posters. 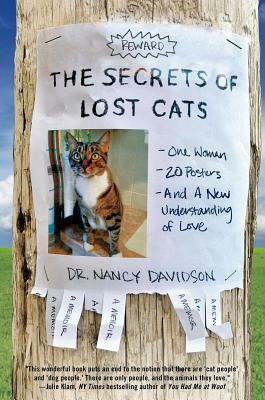 From the astonishing, almost implausible posters she encounters across the country and indeed, the world to the daring, dedication, and emotional complexity of the cat owners themselves, "The Secrets of Lost Cats "offers readers an absorbing journey that illuminates love, loss, and learning to love again, even more deeply.